No boat? No problem! There are plenty of ways to enjoy sailing, even if you don’t own a vessel. It has finally happened – and not at all too soon. It’s that time of year when the days are long and warm, and sunny days more frequent. There’s a gentle breeze blowing as I close my eyes and settle back into past summer memories. Memories of standing braced on the back of the boat, arms stretched taking a backstay in each hand as I balance there – pure quiet except for the sound of the wind and the boat slicing through the Atlantic. Honestly, can life get any better than this? Even keel, full sails and warm sun on my face – a blissful moment for sure! Moments that are treasured because, in truth, our New England boating season is so short and too much of life encroaches on time that I’d rather spend on the water. For those of us who are single and non-boat owners, getting on the water may pose a little more of a challenge. I mean, how often can we beg time on a friend’s boat? Or finagle an invite to crew in that regatta we’ve wistfully wanted to join? Getting on the water under these circumstances requires a little creative planning. Luckily, for those who have been bitten by the wind and sail bug, opportunities abound – we just have to think ahead a little bit. In my experience, friends are usually happy to invite you aboard, especially if you come prepared to pitch in with crewing, food and clean up. My first year sailing with friends was a world of fun, although every boat is somewhat different and every captain has different levels of comfort in letting a guest have time at the wheel. When I began sailing with Jeremy, he was happy to teach me the basics of tacking, jibing and holding a course. But, to turn me loose to set my own course? Well, that was a different story. It didn’t take long to realize that I needed more experience. That’s when I discovered the Crew Connection pages on WindCheck’s website. Quite timidly, I posted on Crew Connection and entered my very limited experience. I was both surprised and excited when I got a call from Hannah to join her Wednesday night ‘round the buoys race team. She had an all-women crew with varied degrees of experience and didn’t seem at all concerned taking on a newbie. All I had to do was show up with my gear and follow instructions. Everybody seemed happy to teach me something new – be it trimming sails or putting up a spinnaker. This was getting good – Wednesday night on the water and some Saturdays. I missed a lot of concerts in the park that summer! Sailing was my newfound passion and nothing seemed to deter me from chasing the dream. Not even a month-long job assignment in New Hampshire where we got up at the crack of dawn on Saturdays to drive to Marblehead for Saturday racing. What’s a two-hour drive when you get to spend the day with wind, water and sunshine…and the camaraderie of the post-race party? It was a nostalgic moment when the summer ended and the boat went on the hard. After helping my friends with the last cleaning and winterizing chores, we left the yard and looked back forlornly at Free and Clear – sitting on jacks, covered and ready for winter snow. Even with winter looming, it occurred to me that this was a good time to prepare for the next season. There was so much more to learn, and my shipmates had given me some guidance for winter instruction. Checking online, I found a class at the maritime academy that offered a weekend navigation course. Tap…click…voila! I was registered. Then I saw some seminars offered at a local yacht club – no membership required – just a $10 fee. Hopefully, the acquisition of some new skills would pay off when summer came, but it wasn’t really about getting on someone else’s boat. My ultimate goal was to captain my own boat – then I could set the course! I signed up for the earliest Basic Keelboat class I could find and committed the next six weeks to lessons and practice. The course was ASA certified so I knew I would be getting the necessary competency skills. This class looked good on my sailing resumé and helped me get more crew invitations that summer, but it didn’t provide all the skills I needed to advance my goals. After considerable deliberation, I made a major financial investment. New England winters are long and sometimes brutally cold and snowy. First snowfall is fun, but by January shoveling snow is just not my cup of tea. But! Down south, not too far across the sea are clear turquoise waters, warm sandy beaches and…sailing schools! For a whole week, I and three other students lived aboard a 46-foot cruiser and engaged in intense training – everything from crew overboard exercises to navigation and engine room. This was the training and vacation I had been craving! I arrived home certified in Live Aboard and Bareboat, and with a stronger resumé for my next charter. Charter opportunities are everywhere! People have a tendency to think of “charter” as a big financial commitment and a week or two of vacation time, but day charters and brief overnight charters are also available. “Charter” is sometimes no more than a fancy name for “rental.” I like to spend time on Cape Cod’s Old Silver Beach, where there is a guy who rents catamarans. Last I checked, the cost was about $25 an hour. My best friend Mary likes to get four or five friends together to charter a daysailer for a Sunday afternoon outing. Everybody on board is an experienced sailor but none own a boat. The day usually includes anchoring in a cozy cove for swimming and an afternoon clambake. Oh, one other thing…never let anybody tell you that sailing isn’t about the food. It never fails. As soon as the sails are full and we’re on a course, the next question asked is, “What’s to eat?” Sailing makes for big appetites, so when you’re planning that afternoon charter, don’t forget the food! 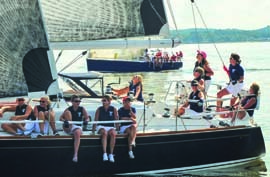 One year our sales team at work chartered a three-day cruise on a schooner. It was great fun sailing but an even better team-building exercise. Not only did we get to man the sails with the ship’s crew, we pitched in with the other chores – cooking, keeping watch, swabbing decks, walking out on the yardarms, and sitting on the decks under the stars singing shanties and talking sales strategies. The next several weeks at the office were incredibly productive as we pooled ideas generated during those three days at sea! Derrick and Jennifer are getting married this summer. They met two summers ago on a windjammer cruise. Guess it comes as no surprise that they have chartered that same windjammer for their destination wedding. They and their guests will embark on a seven-day cruise along the coast of Maine. The windjammer allows plenty of room for festivities while giving guests the option to crew or simply relax under the sails. Kind of makes you want to join the party, huh? My first charter was last summer, when a group of friends decided to pitch in with the expenses for a weeklong charter in the Chesapeake. We arrived in Annapolis and spent seven days harbor-hopping. Seven glorious days shopping in quaint boutiques, swimming in quiet coves and sitting on the deck sipping Dark ‘n’ Stormies and occasionally rafting up with other cruisers. It was a blast, and we’re doing it again this summer! We haven’t decided if we’ll return to the Chesapeake or discover Maine. It’s a coin toss as to where the wind will blow us. But one thing I do know – it will be a summer to remember! My friend Denise owns a beautiful 48-foot Morris. She and her late husband Howard spent many wonderful summers cruising the New England coast, and had even taken an extended cruise to Fiji. When Howard passed away unexpectedly, Denise was faced with a decision regarding the yacht. Her children lived out of the area and she knew she could not sail single-handed. Though her first inclination was to sell, her heart had too many wonderful associations aboard Star Gazer. While discussing her dilemma with a fellow sailor, she was presented with a different option. Instead of selling, Denise joined a cruising club. The membership consisted of members with and without boats. Offering her beautiful cruiser to the club fleet has worked out great for her, with a crew ready to hop aboard for a weekend cruise almost any given week. Almost every major sailing school has a fleet of boats available for use. Sailors who have completed their classes or who can show they “know the ropes” can join their sailing club for a modest fee. Members are then permitted to reserve sailing time, and often have a choice of sailing solo or with other members. Sailing clubs are the next best thing to ownership. My friend Pam is a member of a club in Connecticut, and loves the fact that all she has to do is show up and the boat is ready to go. Sometimes she goes out alone, sometimes with other members and then again other times she takes a non-member guest aboard. Most clubs have an assorted fleet of small- to mid-size daysailers. Some have cruisers that can be reserved for overnight use. All clubs will require that members have the competency requirements for the vessel they will be sailing. Membership fees are usually based on the boat size and frequency that a member may want to reserve a boat. We are truly blessed here on the East Coast to have many community sailing clubs. Membership is very modest and definitely worth looking into. Another alternative is fractional ownership. For many years, Gregg enjoyed owning his own cruiser. As work demands encroached upon his sailing time he decided it was time to give up the yacht. A few years later, life took an unexpected turn and he began to have more time for the passion he had given up for a hectic work schedule. But, he wasn’t quite sure he wanted to jump in and purchase another boat. After weighing the options, he invested in a fractional ownership program. Through the program he chose, Gregg shared a nice 42-footer with four other owners. They could book their reservations online, and had no maintenance obligations other than fuel replenishment and cleaning the boat for the next owner. The program helped Gregg transition to a position of full ownership. After three years in the program, he purchased another cruiser and is now spending much of his retirement exploring new harbors. Boat clubs and fractional ownership both allow us to get on the water and chart our own course without the financial commitment of full ownership. Now is the time to book that summer charter or join a sailing club. Sailing solo is a great way to go, with or without a significant other. Feel the sun on your face, listen to the flapping of the sails as they fill with wind and send you slicing through the open sea. Sailing solo…now is the time. 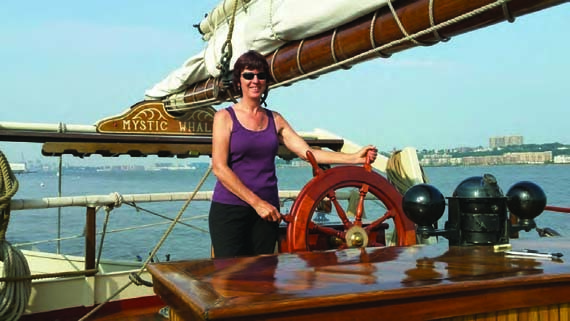 Lexi Parker developed a love for sailing after her children were grown and married, and spent many years sailing Long Island Sound before retiring to Oriental – the Sailing Capital of North Carolina. 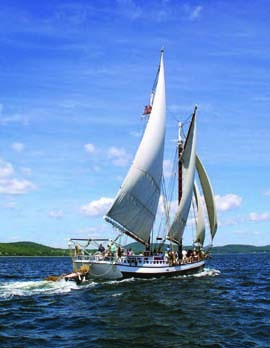 She has enjoyed sailing up and down the East Coast as well as charters in the Caribbean.